Hi and welcome to seempli! The following is a short guide to seempli. You will quickly realize that the concepts at the core of seempli are pretty much straightforward. At the same time, seempli will never stop to surprise you, and you will never cease to amaze yourself. Before you read on, I would like to draw your attention to the Starter Kit Daily Exercises. This collection of 21 curated challenges is designed with two goals in mind. The first goal is to get you familiar with the seempli Platform. This knowledge will allow you to make the most of seempli later. The second goal of the Starter Kit is to help you build a habit. Creativity, just like any other skill, requires practice. The more you practice, the more natural it gets. Working with the seempli Starter Kit for three weeks will get you into a creative flow as natural as breathing. By the end of this batch of exercises, you will be able to use seempli on a daily basis both for ongoing creative development and as an ideation tool in the context of real-world challenges. So, while you can read this guide and immediately use the entire seempli platform, we highly recommend starting with the guided exercises first and only then explore the rest of the platform. If you would like to receive daily reminders for the 21 days of the seempli Starter Kit, feel free to sign up for our newsletter and check the Starter Reminders in your preferences. What Can You Do with seempli? The seempli Platform has two primary goals: the first is enabling you to develop and master your creativity skills and the second is helping you apply them to different challenges and opportunities in every aspect of your life. One of the greatest things about seempli is that these two goals can be achieved using the same means and practically by using the same gameplay. At this point, you might rightfully wonder why I am using the term "gameplay." "Is this a game I've just signed into?" you might ask. So, here's the thing: we believe that creativity and playfulness go hand-in-hand — they feed each other! Letting your mind play is not just a way to achieve creativity — it is the essence of creativity. That is why we designed seempli as a game-like platform. Whether you use seempli to develop your creative skills or to apply them to real-world challenges, a playful mindset will have a much more significant impact on your results. This is not the place to go into all the details of how creativity can be learned, practiced and developed. You can read more about that here and here. But I will say this: we are all born creative. With time many of us become less and less creative just because we are not giving ourselves enough opportunities to use our creative skills. Our goal at seempli is to change that. As simple as that. With that in mind, let's get familiar with the building blocks of the seempli Platform. Seeds are the most basic building blocks in the seempli Platform. Seeds are textual triggers designed to ignite observation and imagination. The primary part of a Seed is its title: a single word, or a short phrase. Some Seeds also includes specific instructions or some inspirational text. In a sense, each Seed is an invitation to see the world differently: to observe things you don't usually notice and to use them as raw material for imagining new things. Seeds are like magical glasses that help you see things differently. The seempi Seeds can be used in numerous ways, but it is essential to master the basic gameplay of using them first. The basic gameplay is defined by the Core Prism (more on Prisms soon): using a Seed for Exploration. It is an as powerful concept as it is simple: memorize the title of the Seed, and throughout the day, look around you mindfully for Insights inspired by the Seed. An Insight is anything you observe, imagine, create or think. It can be a simple visual image you capture with your smartphone camera or a short text you write; it can be a drawing or an idea. When you are just starting to work with seempli using the Exploration Prism, we recommend aiming for visual Insights. They are the easiest to capture, and they are strongly connected to the observational elements of this exercise. The key to making the most of the Exploration Prism and the Seeds you are working with is not to think about what it is you are looking for. Exploration is not a thinking-challenge — it is an associative and creative observational challenge. It is a purely open challenge, with no right or wrong answer. Any Insight you capture would be great. The only condition is that you are happy with it. It is important to note that a Seed is not a one-time challenge. The more you play with the same Seed during the day, the greater the impact of this creative workout has. Try to bring a new angle or a fresh interpretation to the Seed with each Insight you capture. And when you happen to come across the same Seed in the future, try an entirely different approach. This is the nature of working with seempli, and that is what makes seempli an infinite platform. And believe it or not, this is just the beginning. 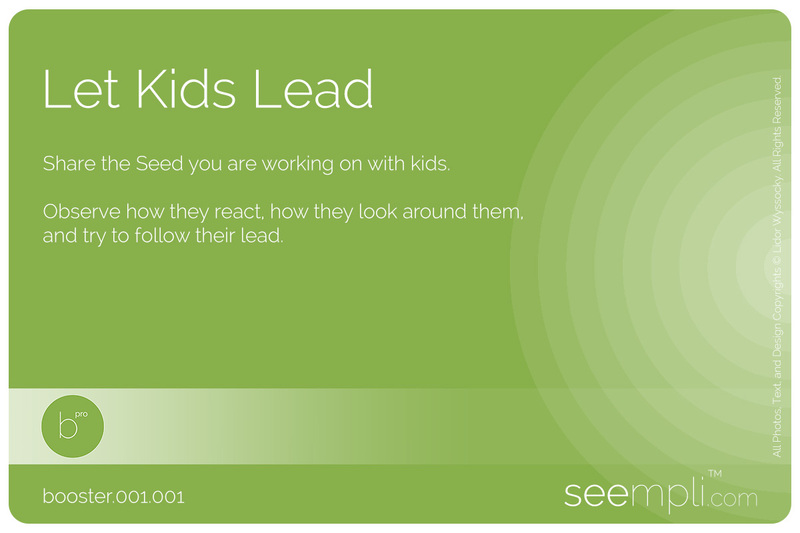 To access a random Seed, use the Develop Your Creativity Channel from the seempli Me page. It will lead you to the Get in Shape page with a daily Seed. 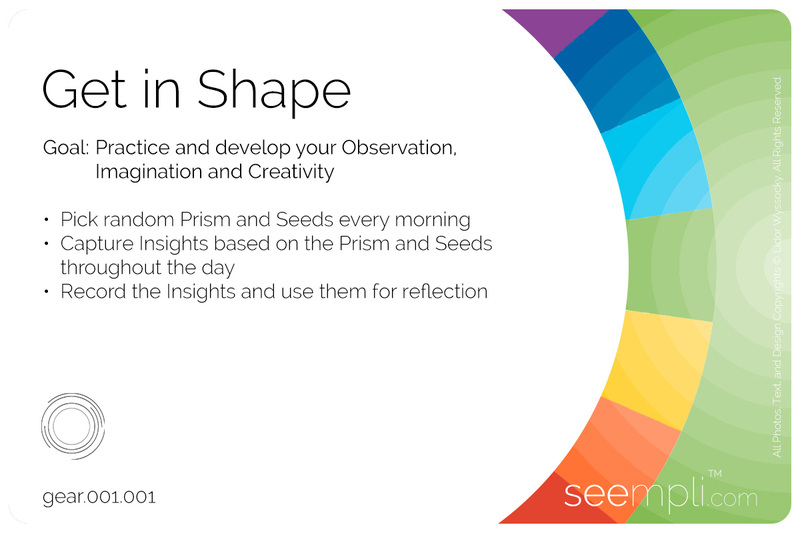 The core Exploration Prism defines the basic seempli gameplay: taking a Seed and using it for observing and imagining wherever you are throughout the day. This gameplay is practically infinite. You can play with on a daily basis and always find new and surprising Insights. But Exploration is just one (essential) variant. This is where the seempli Prisms come into the picture. Each Prism changes the gameplay a little (or a lot) by defining a specific playground, or a constraint, or a workflow. Prisms are designed to spice up the work with seempli and make it even more dynamic and challenging. Not less important, they are essential to developing creativity. 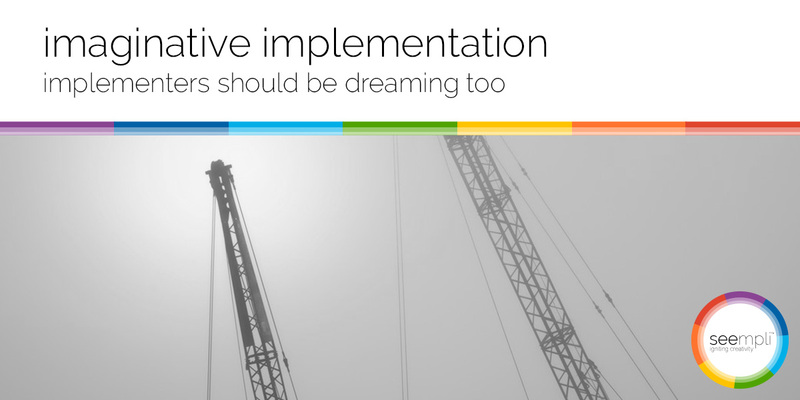 Constraints or limitations, even when they seem arbitrary, are great for boosting creativity. Each Prism can be played with any of the seempli Seeds. This design multiplies the already infinite gameplay and creates thousands of creative challenges, each with endless options for exploring, discovering, imagining, and creating. It should be noted that some Prisms will require you to play at a specific location, or with specific materials, or will just take some time to work with. In other words, unlike the core Exploration Prism, some Prisms cannot be used anywhere and at any time. Still, we highly recommend using them from time to time to master your creativity. Still, if you feel you will not be able to work with a specific Prism at the moment, you can always work with the Exploration Prism. To access a random Prism, use the Master Your Creativity Channel. You will get a Prism and a matching number of random Seeds to play with. You can draw a new set every five minutes. We highly recommend working with the first combination you get. Don't wait for a Prism you feel comfortable with — challenge yourself! In some cases, you are bound to come across a Prism asking you to dive into a domain you might feel uncomfortable with. For examples, seempli includes a set of Prisms oriented at creative writing. Play with them even if writing "is not your thing." 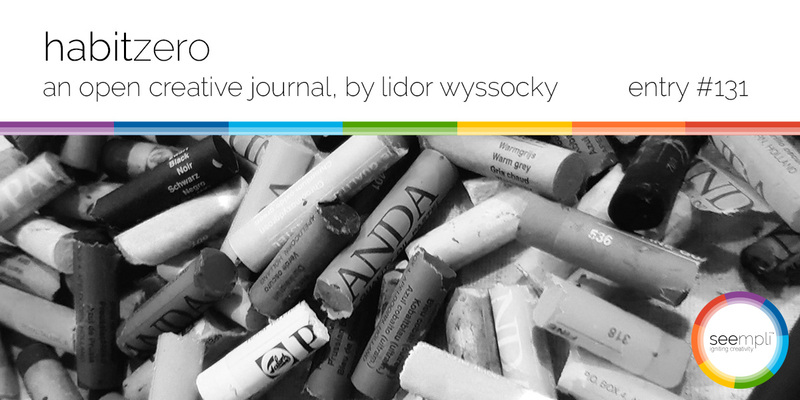 Experimenting with different domains and mediums is part of reaching new levels of creativity. Remember, this is not a test, and we are not aiming to create a masterpiece. We aim at making our minds more flexible by using different capabilities in various contexts. Whatever Prism and Seeds you draw — play with them. Be creative! 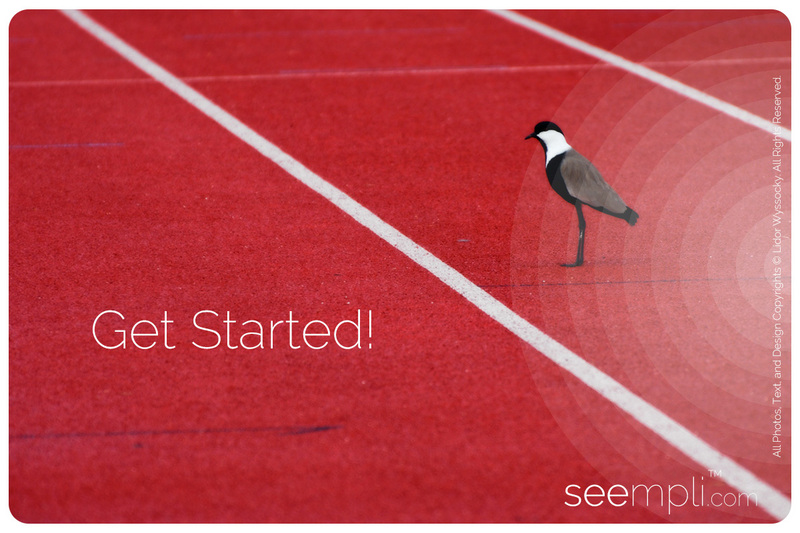 As already noted, seempli is designed both for mastering your creative skills and for helping you apply them. You can use all Seeds and Prisms for achieving both these goals. But to apply them to real-world challenges, the seempli Platform also defines a collection of Gears. Each seempli Gear defines a mini process — a workflow designed to achieve a specific goal or be used for a real-life purpose — using the seempli Platform. For example, the Master Your Creativity Channel will refer you to the Get in Shape Gear which defines the workflow described above for ongoing creativity development. The Generate Ideas Channel includes many Gears designed for ideation, challenging assumptions, and additional Gears essential for generating creative ideas to address any challenge you might be facing. After you get some millage working with Seeds and Prisms, applying seempli Gears should be trivial. 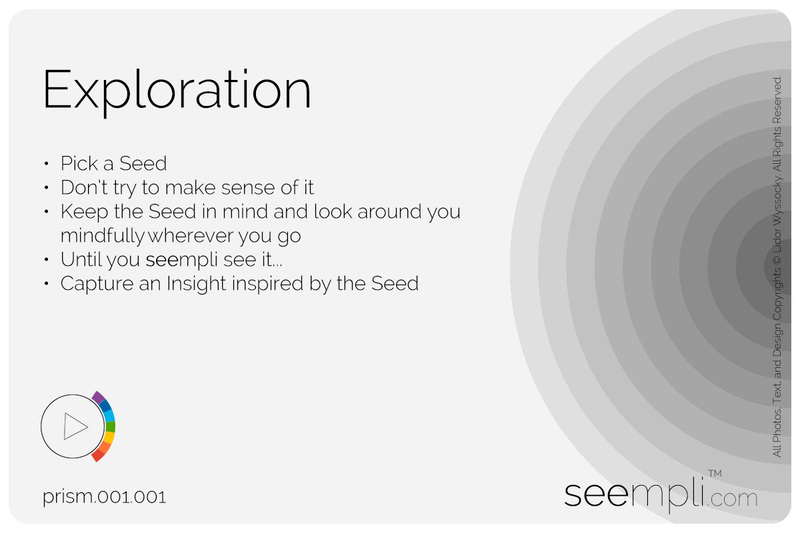 Just follow the steps defined in the Gear and use matching Prisms and Seeds in the process. Each Gear page is designed to provide you all the building blocks you will need to apply the Gear. To make it easier to find the relevant Gear to what you would like to achieve, we have created a variety of Channels — each dedicated to a certain goal. You can access all Channels from the seempli Me page. Just follow the Channel Card, and you will see all the Gears that can help you in that context. Chose one or more, and apply your creativity! seempli Boosters are the last type of building block in the seempli Platform. Boosters don't change or extend the game. 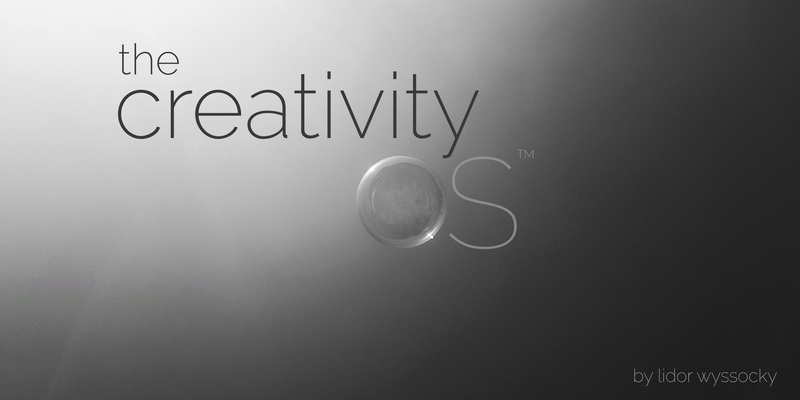 They are designed to help you when you are feeling stuck or need a fresh idea on how to boost your creativity. Each Booster describes a guideline or a tip that can help you ignite your creativity when working with seempli as well as in any other context. The seempli Boosters show up from time to time in some of the Gears. seempli is the ultimate Creativity Toolbox. Our platform is constantly growing, expanding and added with new Seeds, Prisms, Gears, and Boosters. To make the most of it, use it on a daily basis, both for developing and mastering your creativity and for generating creative ideas for challenges and opportunities you face. We highly recommend working with a note-taking app such as Evernote or OneNote to save your Insights for reflecting back on your creative journey. 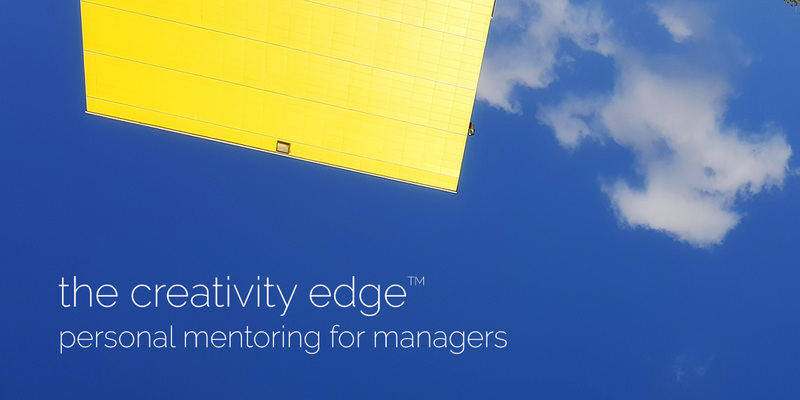 Saving all Insights in one easily searchable place will help you realize what you are capable of and how your creative skills change the way you see the world. It will also enable you to use your Insights in practice in the context of some of the Gears. If you have any question or comment, or if you need further guidance doing your first steps with seempli, drop us a message. We'd love to help you use seempli to its full potential.